Welcome to Gem Valley NC! Happy 2019 Everyone! We'll be open for the season starting May 2nd of this year! We look forward to seeing you! 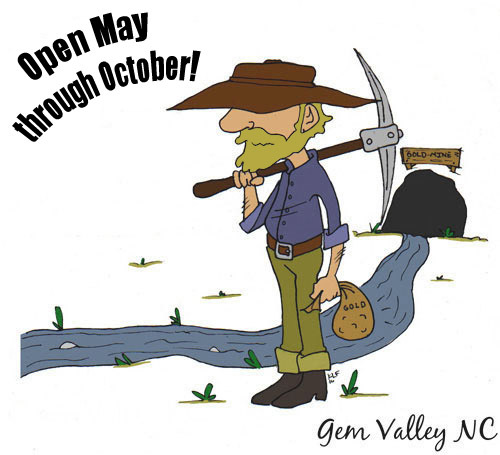 For any questions such as gem identification, please send an email with a picture to gem-valley@gmail.com and we'll do our best to assist. Thank you for a wonderful season, and Happy Prospecting! *Please note that our hours of operation have changed. Additionally, in the case of bad weather, the flumes will be closed. Followers of our Facebook Page have a chance to win free gemstones every month! Our FAQs have been updated with some additional information. Go check 'em out! We will be opening the gates May 2nd, 2019 and will remain open for the season until October 2019. We will be closed on Tuesdays and Wednesdays. Admission into the park and access to the flume mines starts at $10.00. Please visit our Flume Mining page for detailed information on available buckets! *Please note that no new miners will be admitted after 2:00 PM. Note of Interest: This year we have been digging in an area that has turned up many Native American artifacts so there is a chance to find much more in your gem pails than just great gems, and we have also discovered some amazing aquamarine and tourmaline this year. We have expanded the rock shop and added more ore to go through. We hope to see YOU this season!!! What's New in the Rockhound World? February 2013: Scientists discovered how bacteria can change ions into gold! Copyright © 2006-2019 Gem Valley NC. • Last Updated: April 2019.